And on the 7th Day, God rested but the #KetoHackers worked! It’s interesting when I ask people what the main reason is that they want to get shredded. While they start generic (healthy, feel good, stronger) when I dig DEEP into the why, the foundation is always to improve their relationships with others. Whether it’s wanting to attract a mate, impress a friend or just feel more confident, the foundation is always relationships with other humans. So to help you get what you REALLY want, after today’s workout I’m going to reveal to you the #1 Killer of all relationships. It’s simple but it would surprise you to know how often you may have embodied this “killer” without realizing it. In fact, it’s the first thing I teach my employees when they enter as unenlightened boys and turn into Bro Labs Men. The #1 killer of your relationship, in business, romance and all aspects of your life is neediness. The second you “need” anything from anyone, you’ve lost all control. This is especially true in dating. I guarantee you for every “crazy b*tch” story guys tell themselves in complete shock over a girl leaving or cheating on them, there is a crucial detail of them being needy they left out. Women just don’t cheat on non-needy guys. You’ll just have to trust your Uncle Brandon on this one. In fact, the less needy you are, the higher degree of attraction you will draw. It’s almost like a magic magnetic pull that drives you toward success. For example, if you have a great product that you know would help someone but don’t NEED them to buy it, they will see it in the way you present yourself. So how do you become a non-needy badass motherf**ker? A good way to start would to be in awesome shape. It’s scientifically proven that guys with higher muscle mass and lower body fat are more confident and carry themselves in higher regard. 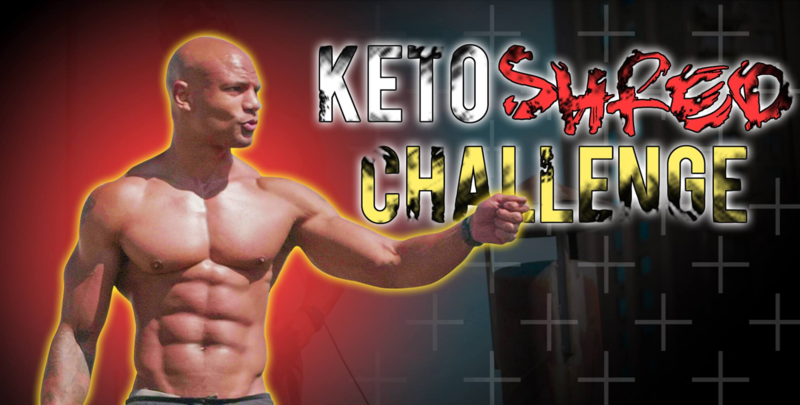 You’ve already taken an awesome step in that direction by joining the 30-Day Keto Shred Challenge. But to help you reach this type of non-needy physique even faster, I’d suggest combining my best-tasting/selling pre-workout “Rebellion” with my signature advanced BCAA’s “Revolt” which are proven to add massive energy and intensity in your lifts + help you retain lean muscle mass during your HIIT cardio sessions. While you don’t “need” pre-workout or bcaa’s to get ripped, it will definitely help you on the days you feel lethargic and don’t want to go to the gym. When creating Rebellion Pre Workout and Revolt Advanced BCAA Fuel we carefully chose a small batch of perfectly dosed ingredients that deliver results you can depend on - every time - with no fluff, and zero adverse side effects. When used together they form an unmatched synergy that is hell bent on increasing energy and blood flow, reducing fatigue, improving muscular endurance, sharpening mental focus and preserving muscle mass. Every company boasts that they have the best pre-workout and/or BCAA supplement on the market. Bro Laboratories takes it a step further. We back up each and every claim with hard science, and legitimate numbers. THE JACKED STACK will help improve overall performance in all types of exercise including anaerobic and aerobic types of training. That means, it’s not just for weightlifting. It’s perfect for cardio and endurance training, too. That means that you can mix them up and consume them before a weightlifting workout and see benefits like increased strength and muscle endurance as well as before a cardio session and see benefits like increased intensity and endurance. The bottom line is whatever type of exercise you do, THE JACKED STACK is going to help you do it way better. BEST PRE-WORKOUT FOR EXPLOSIVE ENERGY. Increases performance and intensity. AMPLIFY MUSCLE PUMP AND PERFORMANCE. Includes Citrulline Malate which has been shown to dramatically increase nitric oxide levels and muscle endurance. PROMOTE LEAN MUSCLE MASS. REVOLT is designed to effectively increase muscle protein synthesis (rebuilding of muscle tissue) both during and after exercise. PRESERVE HARD EARNED MUSCLE. When training fasted your body needs REVOLT BCAAS in order to help prevent muscle catabolism. BURN MORE FAT. Increase fat oxidation and improve glycogen synthesis. IMPROVE ENDURANCE AND RECOVERY. Studies where subjects consumed BCAAS have demonstrated massive increases in their endurance and ability to recover. REDUCE PHYSICAL AND MENTAL FATIGUE. Reaction time decreases significantly both before and during exercise - a major benefit to players who must think and act fast.